Happy new year everyone, and thank you so much for joining us on the incredible journey we have had this year. We are in a good place and are looking forward to 2014, with far less fear than we felt in our hearts this time last year. 2013 has been a year of ups and downs, but honestly there have been so many best bits and wonderful people whom we have met this year, I don’t even know where to start. We are incredibly grateful to everyone who has helped and supported us and contributed to making this year so great. For the friends and family who have supported us and prayed for us and with us. For the therapists and teachers who have given us their help, support and encouragement and who have gone above and beyond to help and guide us. And the new friends we have made, especially through the many support groups we have become part of. 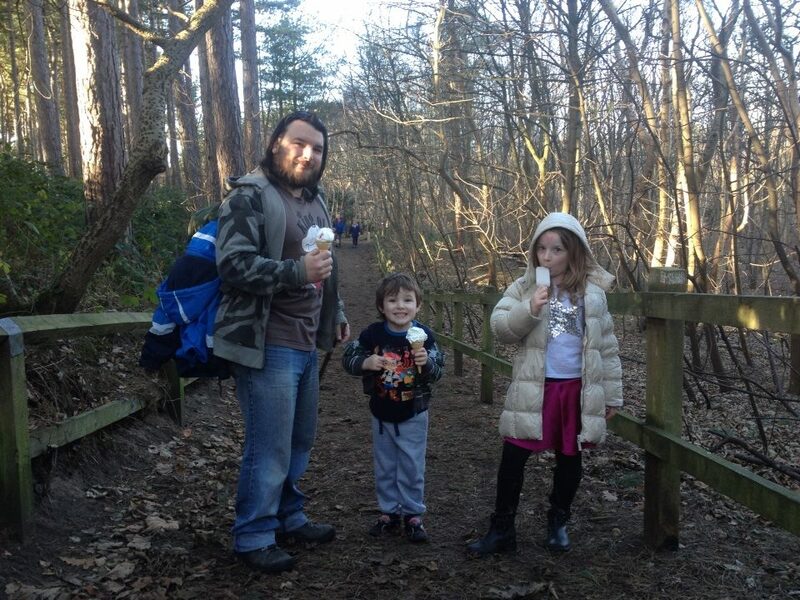 New years walk in the local pine forest, the strange, warm weather made it a good day for eating ice cream. 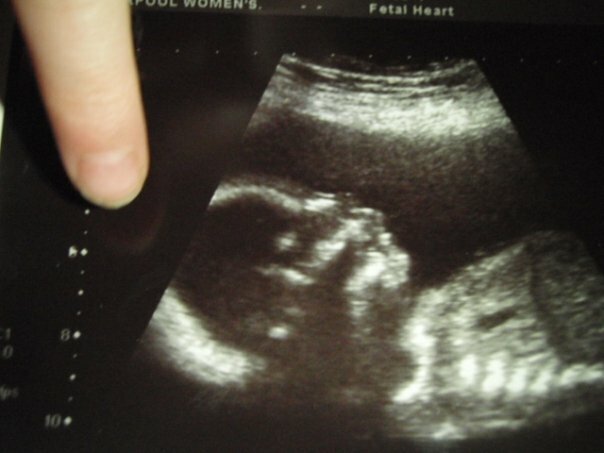 What can you tell me about your child? This week we were invited to have a look at an ASD specialist school as part of the process of being assessed for a statement of special educational needs. 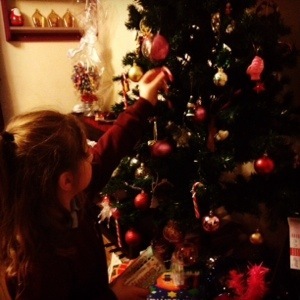 Whilst we still hold out hope that Charlie will be able to attend the same school as his sister at some point in the future we have to consider that there is a possibility that Charlie may be better off learning in a specialist environment rather than in a mainstream school. The school was beautiful, and much more peaceful than I was expecting, I was particularly impressed especially by the quality of the older pupils, and their confidence and ability to speak to us and articulate their thoughts, even when I put them on the spot, in front of their teachers asking them questions about what the best and worst things about their school were. They have a very high staff to pupil ratio, and great facilities for the kids. 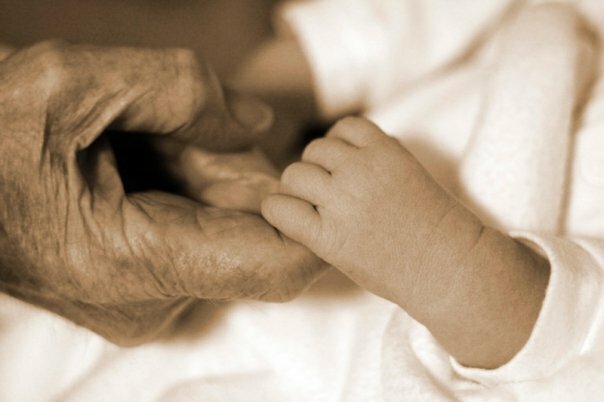 Also as its virtually impossible to access any statutory early intervention or therapy outside of the school system, then we will have to give this place some serious consideration. When we arrived we met the headmistress in her office. A while back I was given a similar question by a specialist teacher, she asked me “what is Charlie good at?” Looking back, I feel so ashamed to say that the question had stumped me for a few seconds. 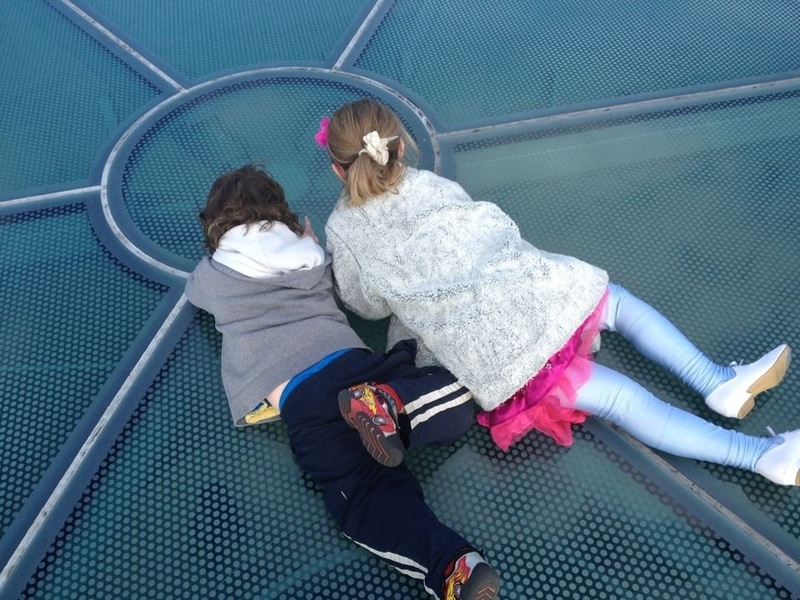 As parents of special kids we get asked so many times to describe our kids in terms of their diagnosis, difficulties or the challenges that they are facing that these questions, although more emotional, somehow become easier to answer. As we walk this road we become so much more fluent in giving answers about what they can’t do rather than what they can do. After gathering my thoughts I told her that Charlie was good at paying attention to detail, befriending children who are shy. He is good at building with lego, following rules, making people laugh and using a computer, he can swim like a fish and run for a long time. The list is goes on further, but I wonder how few times do I actually speak it out? Given the situation on the day and the type of school we were visiting, It would have been easy at this point to start by detailing all of Charlie’s challenges, after all how else would we have got to this point? To this day, and to looking around this school? Maybe she wanted us to justify why we were there, maybe I needed to justify why we were there. But at that moment I felt a check in my spirit, Charlie is far more than his diagnosis and far more than he challenges we have faced as a family over the last few years. Suddenly in that moment it was so clear to me that to have started the day by describing him only in terms of his autism would have been selling him short. So instead I started by telling her how he is cute and funny and bright and confident, how he is super friendly, I talked about the things that he loves, his Lego and ninjas and angry birds. 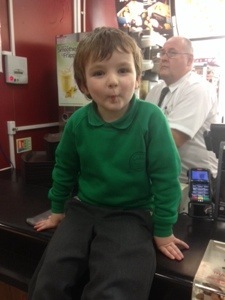 How he is happy and well behaved in school and how is his making great progress with his learning. Only after I had told her what a great kid he is, and made sure that she knew he would be an asset to her school, I added that he has a diagnosis of ASD and that his main challenges arise from Sensory Processing Disorder, and how he thrives when he is in an environment where is sensory needs are met. As the morning went to there were plenty of opportunities to talk about autism and how it has affected our lives and how we hope that the school can meet his needs, and offer him the kind of support he is getting in his current placement. Charlie wasn’t with us on the day, but I know in my heart that if he was and if he had heard me speak he would have felt proud to be himself. 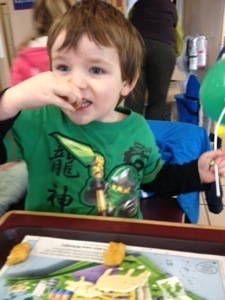 Knowing that his autism is a part of how God has created him and that we are proud of all of who he is. I am pleased to announce that we are now the proud parents of 9 Macdonald’s happy meal furbys, yes I know this is slightly more Furbys than is necessary it appears to be a very fast growing family, and this is the story of how they keep multiplying. 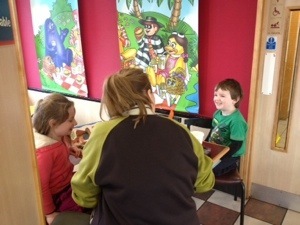 Last week Charlie came home from school with a note saying that for their Christmas outing they would be going to a soft play area in the morning, Mcdonald’s for lunch and then to another afternoon activity. I knew he would have a fantastic day. I am finally beginning to relax into the idea that the school he is in is meeting his needs really well. I sent in a note explaining how we normally handle trips to Mcdonalds and telling them that if they were going to handle things differently that they should tell him before getting there what their expectations of Charlie were going to be. My mum collected Charlie from school that day and texted me to say that there was good news waiting for me. 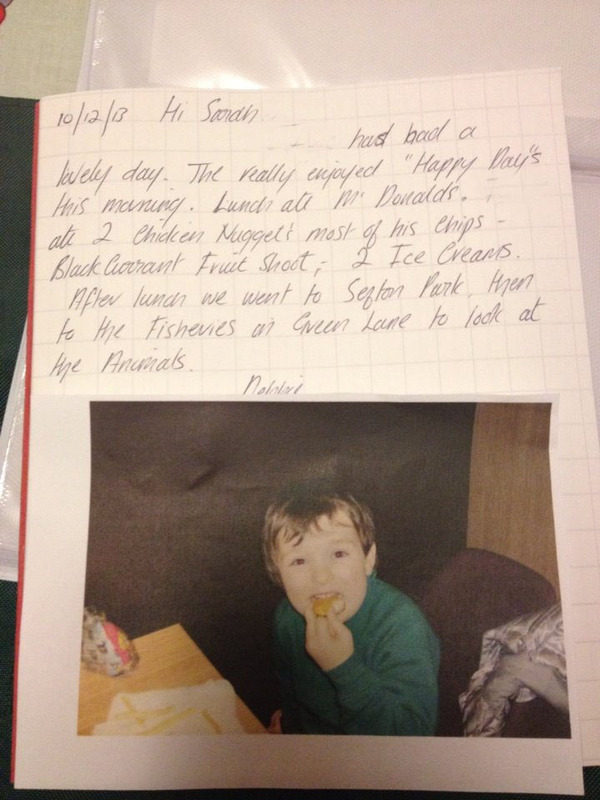 This was the note that came home in his link book. 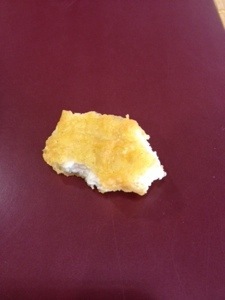 This my friends is no small thing, whilst some may disagree that what is in Mcdonald’s chicken nuggets is actually meat, this is the first meat of any kind Charlie has eaten for 4 years. The previous time was the one serving of cottage pie he ate when he was 7 months old. Also this is the first time in his life that he has ever eaten chips. I was so happy I actually wanted to cry. So we were left with the question of where to go from here, how to reenforce this progress, and whether or not he would be able to generalise eating with the school staff to eating with his family. We have been told that generalizing is hard for ASD kids, they will learn to do something in one place and then only be able to do it there. 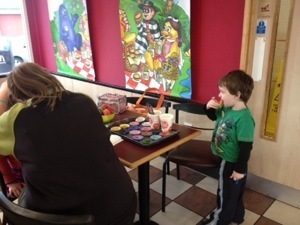 But we decided that 2 days later we would have a go anyway, so we returned to McDonald’s and tried to recreate the magic. 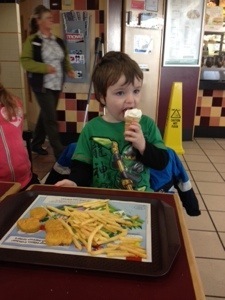 I wasn’t holding out much hope that it would work, but I did explain to him that we would expect him to wait for his ice cream until after the Lillie and her cousin had eaten their nuggets. We bought him his own Happy Meal as we have done a million times before, placed it in front of him and got on with eating our food. He did a great job of ignoring the food, playing with his furby and asking at least 100 times when he would get his ice cream, each time I told him that as soon as the girls finished their food then they would all have ice cream. I asked him if he would like to try a chip, he said no, I asked if he would like to try a chicken nugget, I got the same answer. I was kind of disappointed but not at all surprised that he wasn’t able to eat with us. I was right at the point of giving up the game when I looked up at the door and who was walking in but Charlie’s teacher. Not just any teacher but the very one who has been tasked by the Head of the school with working one to one with Charlie on developing his eating. Like magic, just like that, he picked up his chips and started eating them. 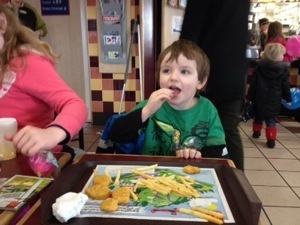 Like an angel, she and her family sat on the next table to us and she gently encouraged him to eat and he did, he had fun and we even had races to see who could eat their Chicken nugget the fastest. Today we decided to try again, I figure we need to get to a point where he will eat the food consistently in McDonald’s before we attempt to generalise it to home or another location, to do this we need to give him lots of opportunities to try, hence the growing family of furbys. We all ordered Chicken Nuggets Happy Meals, even the adults. Charlie tried the chips but they were too hot and he got upset, so we decided that he could have his ice cream while he waited for them to cool down. After the ice cream he was a little reluctant to try the chips so we turned it into a game and played races to see who could eat them the fastest, he loved this idea. We were drawing quite a lot of attention to ourselves with the cheering, the Staff found it very amusing and when we explained the situation even came along to support him. After the chips were eaten and he was struggling to eat a nugget, Lillie was beginning to struggle with the length of time it was taking. Then once again the most wonderful thing happened, and another angel came to our rescue. 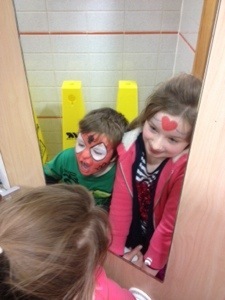 In an effort to encourage Lillie to wait and Charlie to eat the restaurant staff brought out the face paints. 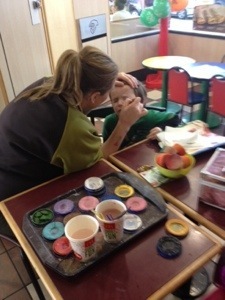 and to reward him for his efforts he had his face painted for free, and Mummy had a Mocha with cream on top! 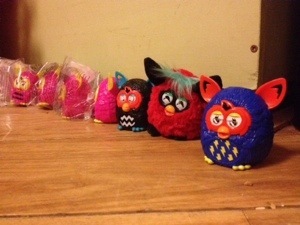 And we all brought a Furby home to add to the growing collection. It is so easy to do too much and expect too much of ourselves. Let me confess I often fall head first into this trap. I have very high expectations of myself, and it is easy, way to easy to push myself so hard that I don’t even know when to stop. I constantly juggle work, home, kids, church, school, business, finance, neighbours, special needs support groups, charity work, meetings, cleaning, shopping the list goes on and on. I often feel like I have somehow managed to get myself onto a treadmill that can’t be slowed down. I feel like I just have to keep going because if I don’t then… I don’t even know what will happen. Its important to keep things real, and part of that is acknowledging when things are too much. Since the summer I have known that I was burnt out and needed a break, but because of the crisis at work, everyone was putting in 110% and it just wasn’t fair or realistic for me to take annual leave. So every day, and for far more days than I should have, I would turn up and keep trying to give my best and to keep up, and every day I was less effective and more overwhelmed. Until suddenly it was all just a mess. Why am I sharing this? well because I know I am not the only one who does this, who feels responsible for everything, who takes on too much, who has forgotten how to say “No”. It happens too easily, we take on things one at a time and the world sells us the lie that we can have it all, we can do it all, we can be all things to all men. That we are supermums who can do the impossible. I am learning (the hard way) to set boundaries, to know when enough is enough and to stand my ground. I have had 2 weeks at home, trying to get my head together. I have rearranged my furniture because that always makes me feel better, and I have taken some time to enjoy small things like decorating the tree with the kids, and sharing a meal with our neighbours, and watching a few episodes of Miranda. This week I have gone back to work with a clearer mind, and more realistic expectations of myself, I have moved my desk to a quieter and more brightly lit location where I am hoping it will be easier to work, and I have reduced my hours so that I have one guaranteed full day at home every week. I have to remind myself that it is important to look after me as well. I can’t be a good mother and wife and employee and everything else if I am limping along half exhausted. So once again I am going to give myself a fresh start and attempt to do less.